Minds work best when they are like a parachute, open (we all know that quote, right?). I think there is a huge difference between having an open mind and having your brains fall out. Don’t tell my Dad, but I am a whisper hippie, progressive, alternative. I mean, I think he has a sneaking suspicion, but let’s not confirm his fears, huh? Anyway it’s his fault I am all these things (for the record, my Mom’s open mind influence had NOTHING to do with this, nothing). Seriously though, when I had my break from the Ranch, I got out there and tried new things, it was great! When I didn’t have the financial backing, or the support of the Ranch, I was forced to learn a ton and I think I am a better and more interesting person because of it (trust me, having everything you’ve thought and loved taken away from you, will change your point of view like no other). I kept my mind open, but I didn’t let my brains fall out. One of those new things I learned about was Kombucha. It’s a fermented tea, with probiotics and stuff. Every time I think I am getting sick, I tend to chug this like its my job. But, really, I mainly like it because it’s fuzzy and not soda. This is what a jar of kombucha looks like. My friend gave me a SCOBY (a symbiotic colony of bacteria and yeast) about a year ago, since I’ve start brewing my own Kombucha. I’ve enjoyed it immensely. Especially because some of my friends trade me stuff for it, and now that I am working on the Ranch full-time, I love me some good trades (always looking for jars, produce, neat stuff, money). 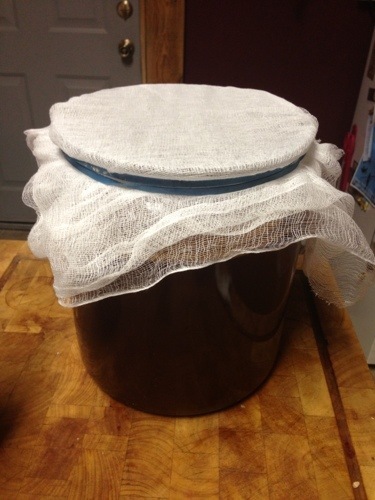 It seems counterintuitive to share my recipe, but it is kinda a lot of work to keep a SCOBY going, so I’m not terribly worried. I make my Kombucha in two, 2 gallon batches (because go big, or go home, right?). I got inspired to share this knowledge because my friend and fellow blogger, Jessy wrote about keeping her food choices in check and this is one thing I do. 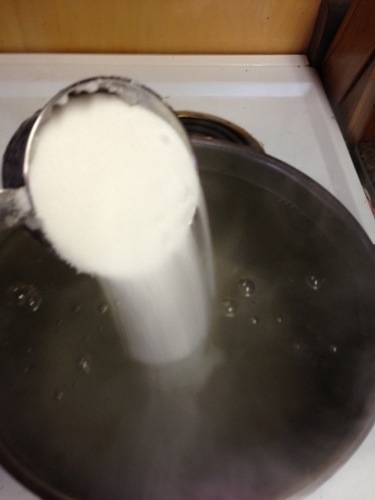 I give you…..
Sugar. Some people swear that you have to use organic sugar or raw sugar, but I’ve had no problems with regular old white sugar. Just don’t use honey. Bring your water to a rolling boil. Add sugar and tea. Let sit for 30 minutes. Remove tea bags. Place tea in large jar until completely cool. Once completely cool ( I cannot stress this enough, you will kill your SCOBY if your tea is warm), place kombucha and SCOBY in your jar. Cover with cheese cloth for anywhere from one to two weeks in a dark place in your house, and depending on the temperature of your house, (I have no A/C so it’s about a week in the summer, two in the winter when I place in next to my wood stove), you’ll see your tea form a new SCOBY and have lots of bubbles, that is how you know it is brewing. However if you see mold, something went wrong and try again. 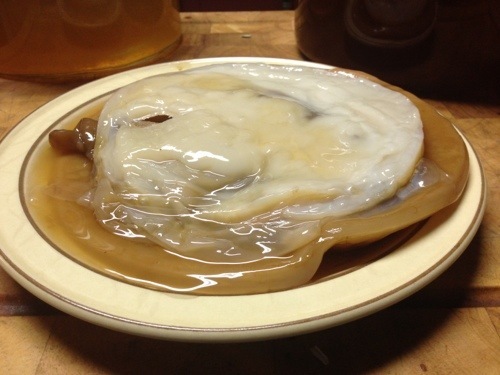 This is a SCOBY. The newer one is on top. You separate the two and use the new one to start a new brew. Once your to this point you can drink your Kombucha or you can tune back next week and learn how to infuse fruit and bottle this stuff (I highly recommend you do). So where do I find kombucha to try if I’ve never had it before? Keeping in mind I live in upstate NY, not exactly hippy-central… (although the county did recently acquire a Whole Foods store). Whole Foods will have it, as any health food store. Good luck and let me know what you think? 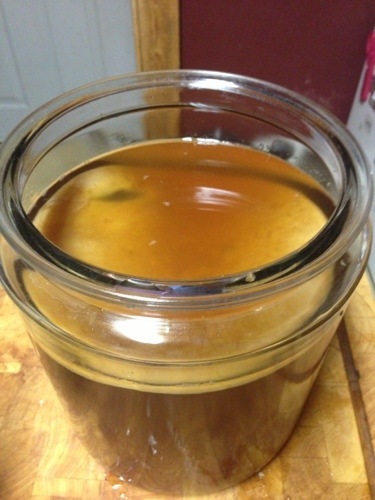 I’m getting a scoby from a friend tomorrow . Very excited to see how it goes. I’ll check back for the fruit infusing. Oh boy, now I really have incentive to write the next post! Saw a lot of this in Portland Oregon. Was afraid to try it on vacation… lol. You never how things react with an aging digestive system. I do something very similar to this, except I use a slightly different recipe. I tend to store it in a large container for a few weeks before transferring it to bottles and adding a bit more corn sugar. Then I leave it in the bottles for 3 Weeks plus. I think it’s also a healthy drink, I honestly do feel a lot better when I drink it! YES!!!! I am so excited to brew some in our dorm kitchen… more reasons for our housemates to raise their eyebrows 🙂 Thank you so much for posting this, Megan.